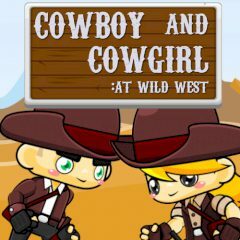 Two adventurers who are Cowgirl and Cowboy, have just embarked on an adventure in the wild West. They have just entered a huge labyrinth and now they are looking for the way out. They must solve the puzzle of the level first to reach the exit door. Lots of entertaining game level with entertaining puzzles awaits you. Let another two player adventure begin!